The International Day to End Impunity for Crimes against Journalists is an UN-recognized day observed annually on 2nd November. The day focuses on encouraging the media workers and journalists to talk about their issues of safety, struggle and impunity stories among government and non- government actors and the public. 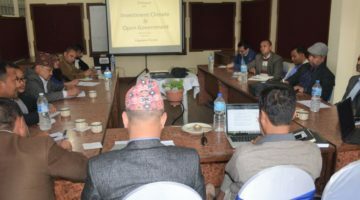 In Nepal, Freedom Forum observed this day by organizing a program at Kathmandu where stakeholders from various sectors came together to mark the day. Two journalists working on the investigative and courageous theme were honored amid the program. Also, the program became the platform to share stories about the atrocities faced by victim family of the slain and disappeared journalists who pleaded the government to end the impunity that they are sustaining since their childhood. A documentary named Impunity Plagues Media prepared by Freedom Forum was showcased in the program that highlights the status of the slain and disappeared journalist’s family in Nepal. The event brought together 93 persons working in diverse sector. Mr. Anup Raj Sharma, Chairperson at National Human Rights Commission was the chief guest for the program along with the special guests such as Ramesh Bista, General Secretary, Federation of Nepali Journalists, Harihar Birahi, Ex-President, Federation of Nepali Journalists, Ex-Chair, Press Council & Coordinator of Prize Selection Committee, Manchala Jha, member of Truth and Re-conciliation Commission, Subodh Raj Pyakurel of Informal Sector Service Center. After the documentary screening session, FF Executive Chief Taranath Dahal welcomed everyone highlighting on the objective of the program. Meanwhile, Mr. Dahal shared about the hardships; the journalist has gone through for the institutionalization of press freedom in Nepal. He remembered those who lost their lives in the process of insurgency and stressed that the victims and their families have still not been able to receive justice. Amid the program, he welcomed two commendable journalists who have greatly contributed in the field of journalism and freedom of the press for their untiring effort for writing news on the investigative issue. Later in the next session, both the journalists were awarded with the Courageous Journalism Award and Investigative Journalism Award respectively. Moreover, the award was presented by Chief Guest, Anup Raj Sharma, Chair, and National Human Rights Commission. The award for the investigative journalist was given to Ramesh Kumar working at Himal Khabar and Ram Bikash Chaudhary was awarded with courageous journalism award. In the storytelling session, Trishna Acharya, daughter of slain journalist Dev Kumar Acharya shared how her family was targeted by the political leaders continuously. She said that, “My father was killed because he was vocal”. After the death of her father, they have no other option than relying on Truth and Reconciliation Commission. Adding to her statement, she shared that at the age of 11, she lost her father since then her nights are sleepless in a hope when will justice prevail. Pabitra Rokka daughter of a disappeared journalist, DhanBahadur Rokaya, shared her struggle and expressed her pain through her shrinking voice and added that she doesn’t even remember his father’s face as she was only 5 when he was brutally killed. But now as she has grown up, she has come to realize the struggle behind it. Breaking the emotional scenario, Chief Executive Taranath Dahal concluded the session saying FF will continuously support to raise the voices for justice. Furthermore, Department head of Journalism and Mass Communication, Chiranjivi Khanal focused on the problems that journalists have to face for maintaining press freedom all around the world. he said that freedom of journalists is linked to freedom of society. He praised Freedom Forum for organizing such programs and said that one should raise voice for social justice. He strongly believes that if impunity is addressed the view of society towards justice will be changed positively. Similarly, Ramesh Bista, General Secretary of Federation of Nepali Journalists viewed that the people in power are ignoring the culprits of press freedom violations thus the incidents are not being addressed. In the end, being a representative of FNJ, he has requested to take strict actions against the culprits. Chairperson of INSEC, Subodh Pyakurel said truth is the first step towards journalism. Impunity, democracy, and development cannot move together, thus lead to corruption. Cases of present impunity culture have frequently been closed down by the court without reaching a just conclusion. So, he strongly requested the government to come up with a solution for ending this culture. Member of the Truth and Reconciliation Committee, Manchala Jha pointed out her position has bounded by certain rules and regulations. She can’t even speak and write in these matters. All around the world journalists are being killed and murdered. She admitted that FNJ has given 14 names still they are not able to give justice to those killed journalists. Moreover, she accepted it as a challenging job and talked about how the government is neglecting to address such important issues. Harihar Birahi gave heartfelt thanks to FF for recognizing investigative and courageous journalist. The days before, when investigative journalism was not developed, there was no one to listen complains of the victims. He said that even the government doesn’t value the journalists in the country. He praised FF’s decision to recognize contribution ofjournalist in this sector and congratulated the one who were awarded in the program. Anup Raj Sharma, Chief Guest, Chair, National Human Rights Commission shared his experience being a law practitioner for 31 years and judge in the court for six and a half years. In the meantime, he expressed that the victims are facing so many difficulties each and every day, but government is unable to solve their problems. Giving an example, he said India is a country with mature democracy, but still so many cases of impunity go unnoticed. The change will not be possible until people who have actually gone through struggle and people with strong vision comes in the power, he added. Concluding the program, Hari Binod Adhikari, Chairperson of Freedom Forum said that the brave voices such as the daughters of the slain journalists who just shared their stories will hopefully work in bringing change. He added that speaking the truth has itself become a challenge in the present world.